Mycorrhizas are fungal associations between plant roots and beneficial fungi. The fungi effectively extend the root area of plants and are extremely important to most wild plants, but less significant for garden plants where the use of fertilisers and cultivation disrupts and replaces these associations. Mycorrhizas are beneficial fungi growing in association with plant roots, and exist by taking sugars from plants ‘in exchange’ for moisture and nutrients gathered from the soil by the fungal strands. The mycorrhizas greatly increase the absorptive area of a plant, acting as extensions to the root system. Phosphorus is often in very short supply in natural soils. When phosphorus is present in insoluble forms it would require a vast root system for a plant to meet its phosphorus requirements unaided. It is therefore thought that mycorrhizas are crucial in gathering this element in uncultivated soils. Phosphorus-rich fertilisers are widely used in cultivated ground and not only reduce the need for this activity but are thought to actually suppress the mycorrhizas. For this reason it is best not to use phosphorous rich fertilisers in conjunction with mycorrhizal fungi. Neither fungi nor plants could survive in many uncultivated situations without this mutually beneficial arrangement. Mycorrhizas also seem to confer protection against root diseases. Toadstools, especially ones that follow root runs and appear below trees, can be a sign of ectomycorrhiza (mycorrhiza living on the outside of a plant), as are the fungal coating and odd branching structure of affected tree and shrub roots. Endomycorrhizas (mycorrhiza living within a plant) are difficult to detect without laboratory facilities. There are other more specialised mycorrhizas, including ones where the fungus supplies organic compounds to plants, orchids for example, that break down soil organic matter. 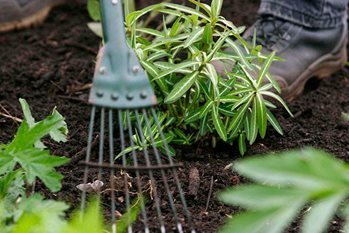 Mycorrhizal fungi are often seen in gardens but may be less effective on frequently cultivated soils that have been heavily fertilised and manured. Use of fungicides can also inhibit mycorrhizal fungi. It is good gardening practice to use the lowest feasible amounts of manure, fertiliser, fungicides, and cultivation. This will not only save gardeners time and money, but also helps towards protecting the environment.